Chennai formerly called madras is the capital of the Indian state Tamil Nadu and is located along the coast of the Bay of Bengal. The city is known for its cultural, educational and economic centers in South India. Chennai is the sixth largest city in India and is one among the hugely populated urban cities. The city of Chennai houses many ancient and historical relics and structures. 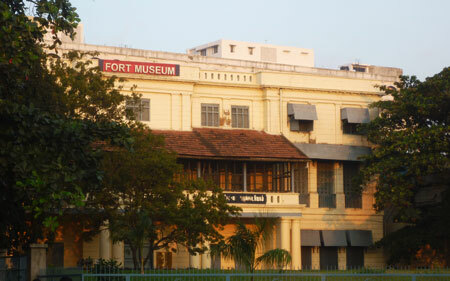 The St. George Fort Museum in Chennai is one place that houses such relics. The Fort St. George was built in the year 1644 and is now a museum that showcases the British history in South India. This museum is a hub for historians and people interested in knowing the history and the independence struggle in India. The building is of European style and has cannons, collections of uniforms, armaments and other items from the British period in India. There are a few life sized portraits of British generals, lords and other envoys who administered British rule in India hanging on the wall. This place has been one of the most coveted place by historians and tourists in South India. The Arignar Anna Zoological park is located near the fort along with the Kishhkinta Theme park and the Cholamandal artists’ village. The museum is visited by many tourists throughout the year owing to its rich cultural and historical showcasing. This place would give you cherishing memories and awe-inspiring grandeur of Indian history.